Made for a swap on one of my boards where you need to include 2 notecards, handmade or storebought. 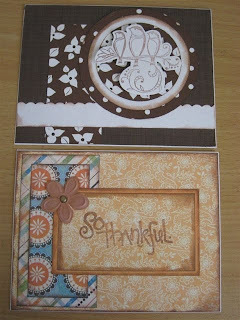 The brown & white one has pop-dots to elevate the birds of the circle for texture (I love the bird stamp). The other one is simpler with my favorite MME papers and a matching Prima. That MME paper is some of my fav as well. Great cards. I'm sure they enjoyed them. Those turned out very pretty!! Love the birds! !